A photo of Terri on the front page of the Charleston Daily Mail the day after the snow's arrival. Chicago loves winter. Talking about it at least. Inevitably, you’ll lament the most recent snowfall with your neighbor. Inevitably, a Facebook friend will post a screenshot of Chicago’s zero-degree forecast. And, inevitably, a media outlet like us will bring up the Chicago Blizzard of 1967 — if only to remind everyone that today’s bad weather could always get worse. Was there really a trainful of snow surplus shipped from Chicago to Florida school kids? How did that even happen?! I’ll tell you right now: It happened, all right, and the story’s details are worth revisiting. Because when you retrace the making of this Chicago mini-legend, you can see click-bait journalism being written across the front pages of mainstream newspapers — 40 years before its time. The story of the Chicago Blizzard of 1967 starts on January 26, when it snowed for 29 hours straight. Having been 65 degrees just two days before, the storm took many people off guard. More than two feet of snow covered the region, with reports of drifts up to 10 feet high. Cars were discarded like cigarette butts over expressways. There was no public transportation, no access to grocery stores, no way to get to work. Twenty-three people died in the Chicago area, mostly from heart attacks while shoveling snow. It took three weeks for the Department of Streets and Sanitation to plow the city streets. Desperate for places to put the stuff, they dumped it in any vacant lot they could find: Park District land, neighborhood lots, even the Chicago River. Some Chicago rail yards came up with their own solution for snow that built up in their depots. It’s kind of bizarre in its simplicity: Shove it on freight trains already heading south. The warmer weather would do the job, melting the stuff in transit. “They sent it because they wanted to get rid of it,” A.W. Pirtle, supervisor of the Illinois Central Railroad’s Memphis depot told the Associated Press (probably rolling his eyes). And in Chicago, the ordeal made front-page news. Dozens of train lines followed suit, and this solution — extolled in headlines such as this — grew into a national story. It was picked up by the Associated Press, and photographs of trains carrying heaps of sooty, Chicago snow from the blizzard appeared in papers around the country as the rail cars made their way to Tennessee, Alabama and Texas. The story was even picked up by national television, and eventually reached the ears and eyes of a 13-year-old girl in the town of Fort Myers Beach, Florida. We found that girl through the White Pages. Her name is Terri Bell (last name Hodson at the time), and, at age 61, she still lives in Fort Myers Beach. She says after hearing the broadcast about trainloads of Chicago snow heading south, she wrote a letter to William Quinn, the president of the Chicago, Burlington and Quincy Railroad, asking him to send her some snow because, as a Floridian, she had never seen any. It’s just that 13-year-old Terri Hodson hadn’t realized that all of the other southbound snow was shipped in uninsulated cars — the whole point being to melt. But Quinn, possibly sensing a brilliant PR stunt but possibly out of the goodness of his heart, had the snow shipped to Florida in refrigerator cars. And if the media went bananas over Chicago railroads sending snow south in uninsulated cars, they went banana sundaes when they heard about the special, frozen shipment to school kids in Florida. And in Chicago, yet another front page story hit The Chicago Tribune. On February 27, 1967 — after almost a week in transit — the snow came rolling into the Fort Myers train depot, where thousands neighbors, parents, and kids were waiting. Some were skeptical, but a good number of the kids looked forward to playing in the white, fluffy, powdery stuff they’d never seen before. I had expected it to be soft and powdery. You know, like, dripping snowflakes and it would just come pouring out of the car. Unfortunately after a week’s ride in a refrigerator car it was no longer soft powdery snow. It was quite icy. You could still kind of form it a little bit and do something with it and people were trying to build snowmen and snowballs and make snow angels and do the best they could with it. But, it was still snow and I could say I saw snow. Nearly 50 years after the event, Terri remembers playing in the snow was not that much fun. "It was the fact that I really got it, and all the cool things that happened to me around that," she says. "Everybody says you’ll have a claim to fame once in your life. That was the most exciting thing that happened in my life." And though the snow melted almost immediately in the 80-degree Florida heat that February day in 1967, the short buzz of fame Terri felt has stuck with her ever since. The story about the Florida snow train had a lot of heart, but why was it enough to make the era’s national media go berzerk? Bruce Evensen, director of Depaul University’s journalism school, says part of the explanation is that there were few media outlets at the time. Evensen, who’s now 64 and was 16 during the blizzard, reminds us 1967 wasn’t the age of social media. Cable television was still relatively new, and NPR hadn’t even been founded. He says the issue wasn’t just that there was less “news”; hardly any of it was “second day” or feature stories. 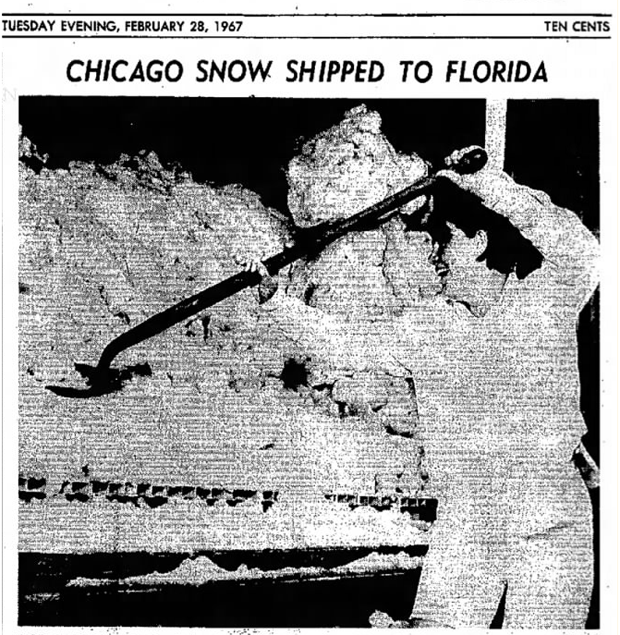 Basically, in 1967, “news” was hard news, and the Chicago-Florida snow train story was not only an exception, but an exceptionally popular one. Why? “A story of what to do with the snow when a city reaches the point where it can’t handle snow is an interesting thing,” Evensen says. And what made that irony particularly resonate, Evensen says, was Chicago’s nickname as the “Phoenix City,” coined by Chicago Tribune managing editor and later city mayor Joseph Medill after the Great Fire of 1871. The story’s news hook was its irony factor — a gesture of Midwestern politeness and can-do spirit, a simultaneous high-five and slap in the face while the city dug itself out of a frozen hell. And, considering the story’s national virality as a slice-of-life spinoff outside the breaking news world, it’s fair to call it a harbinger of a media landscape to come. It was a hashtag before its time. Evensen suspects that, “properly handled and exploited,” the Chicago-Florida snow train story would get even more press if it happened today rather than in 1967. One reason: There are more news outlets and more competition for stories between them. Another reason: The media offers more social and cultural context to news stories than ever before, and coverage continues as long as there’s proof of listener interest, Evensen says. So, to the Floridians out there looking for their claim to fame: consider the next northern blizzard your big break. And pro tip to Chicago journalists and bloggers: Fact-check the legends. Some are still in the White Pages. Logan Jaffe is Curious City&apos;s multimedia producer. Follow her on Twitter for more of these kinds of shenanigans. Curious City Live: This Show Was A Disaster!